While Texas's state nickname is, famously, the "Lone Star State," it should perhaps be referred to as the White Elephant State among travel writers and would-be almanackers, in reference to the impossibility of the command, "Don't think about a white elephant." It is apparently impossible to discuss the state of Texas without referring constantly to its size. Everything grows bigger in Texas. Texas is the second largest state in the U.S. Texas is the largest state in the 48 contiguous states. Texas contains a county that is larger than Connecticut, Rhode Island, and Delaware. Imagine: a single county! In deference to this, here is the Online Highways contribution to this long-standing tradition: Texas is big. 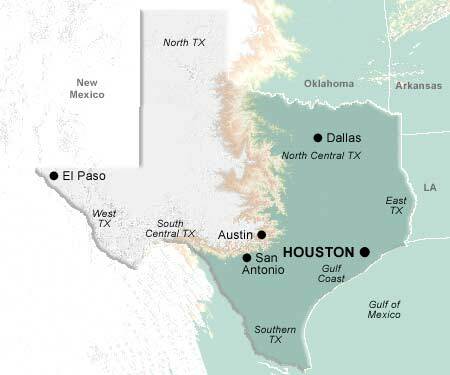 That being said, Texas is home to over 125 state parks and forests, and counts 90 mountains over a mile in height, with the tallest being Guadalupe Peak at 8,751 feet. Size aside, Texas is a study in contrasts: West Texas is an arid desert, while East Texas is a Southern hothouse, with a climate more often associated with Louisiana or Florida. On one day, Texas recorded simultaneous temperatures of 106 degrees (in Brownsville, on the southern Gulf Coast) and 35 degrees (in Amarillo, in the Texas "panhandle," that square chunk that protrudes from the northern border of the state). While you may own any handgun, shotgun, rifle, or semi-automatic assault weapon in Texas without a license, be sure not to use it on another human being, or you may join the 335 people executed in Texas since 1977 (35 percent of all U.S. executions, which, we can all agree, is certainly a big number). Texas works diligently to maintain an atmosphere of slow, rural living. Admittedly, much of the state is given over to farming and ranching, with a state cattle population of 16,000,000, but there is much more to Texas than agriculture, or oil production. Between the slow drawl made famous by John Wayne and the Presidents Bush, the penchant for cowboy paraphernalia, and the overt fascination with historical Texan lore such as The Alamo and the battle of San Jacinto, it is often easy to forget that Texas is home to NASA, several major universities and leading research facilities, and such modern marvels as Dr. Pepper, which was invented in Waco. The state song of Texas, "Oh Texas, Our Texas," includes the lines, "Boldest and grandest, withstanding ev'ry test,/ O Empire wide and glorious, you stand supremely blest." While an uncouth person from another state might find it odd that a state that has been a part of the United States since 1845 should refer to itself as an "empire," surely we can all join the Texans in singing the chorus: "God bless you Texas! And keep you brave and strong,/ That you may grow in power and worth, throughout the ages long." Then perhaps we could all drop on in and celebrate Lyndon B. Johnson Day, August 27, with a rousing fusillade of "Yeeha!"